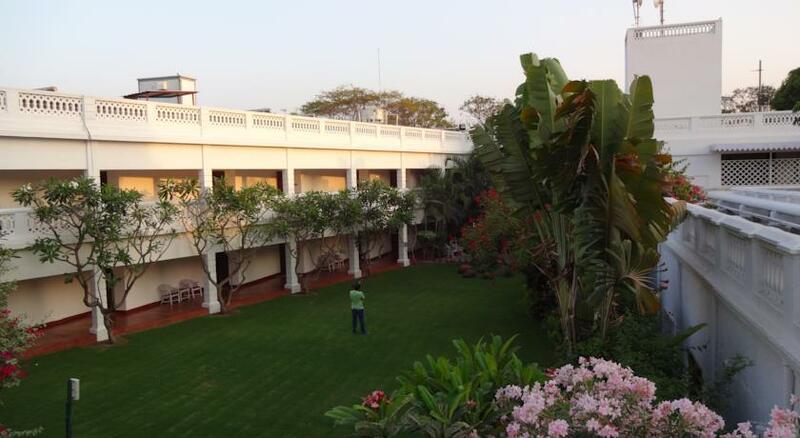 Spread in the lush green five acres land of Shamla Hills, Jehan Numa Palace is a royal treat to the guests visiting Bhopal. Built in the dominance of Sultan Jehan Begum by her second-son General Obaidullah Khan, the palace was converted into a world class hotel in September 1983. Established in a blend of British colonial, Classical Greek and Italian Renaissance architecture is a grand palace with royal accommodation and luxury treatment to its guests. And to add more charm to the beauty of this royal palace, there is a beautiful swimming pool, horse riding track, a well-equipped fitness center and a relaxing spa. 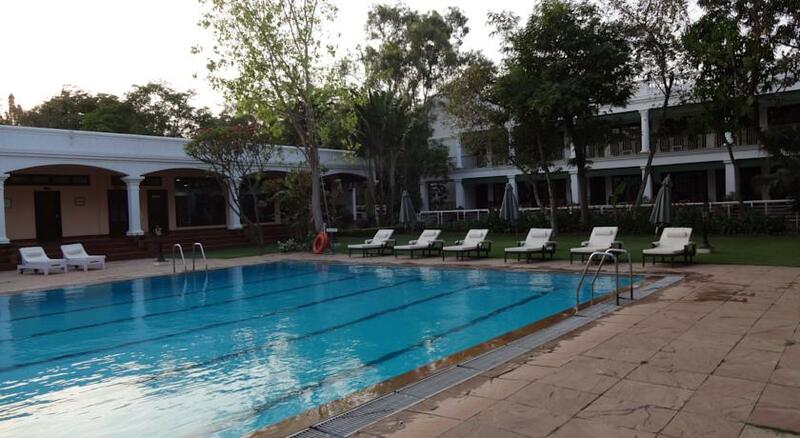 Jehan Numa Palace has full potentials to make the guests stay an unforgettable experience of their lives. 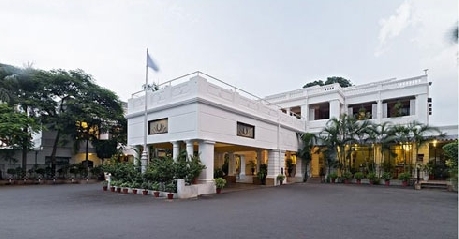 Considering the royal luxurious accommodation and treatment of its guests, the Jehan Numa Palace is regarded as one of the finest example of Bhopali hospitality tradition which was once practiced for the 'Nawabs'. 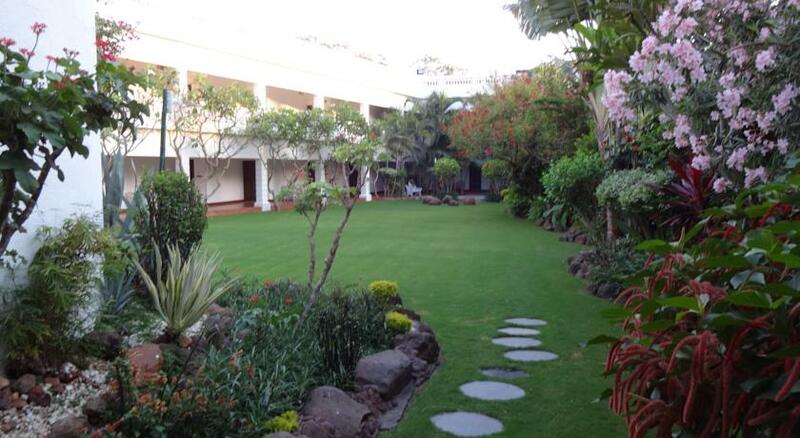 Introducing with an exquisite courtyard view at the outdoors, Patio rooms offers heavenly pleasure to its guests. Designed to give complete personal space to large families or group of people who want to enjoy their personal space, Patio rooms of the Palace are just perfect for them. Featuring one of the fine bathing equipments like single vanity, deep soaking tub, shower and 24hour hot and cold running water facility, the rooms are just what one desires for. 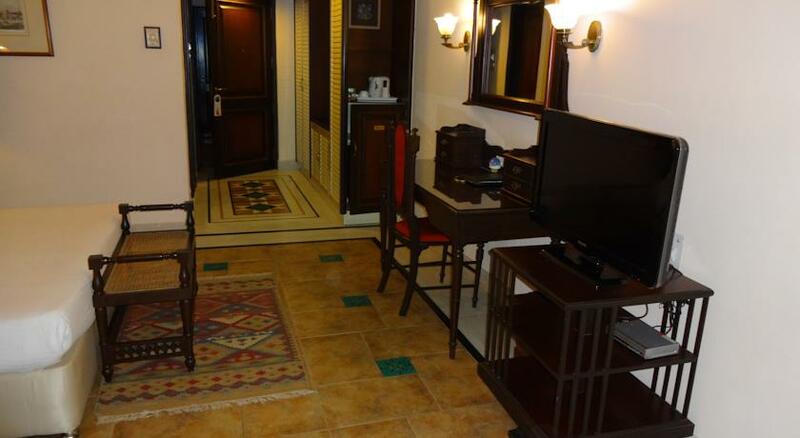 For uninterrupted entertainment and connectivity, a television and wireless internet access is provided in every room. 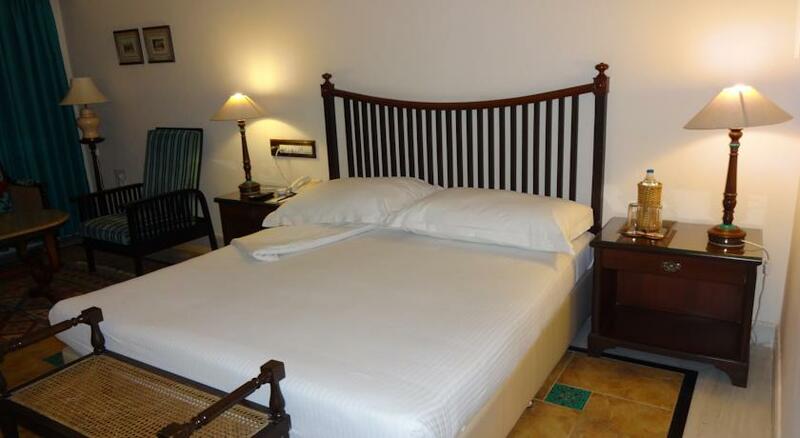 The rooms are completely air-conditioned and have their own mini bar and coffee/tea maker. Placed in the heritage extension with wide veranda outdoor and the view of central courtyard from windows, Regal rooms are built with high ceiling and spacious indoor to give ample of space to family guests. To keep the guests connected with their important work, a decent work area with chair and writing desk is provided and a LCD TV, Wireless Internet access, coffee/ tea-making machine, private bar and telephone facility is available in all rooms. 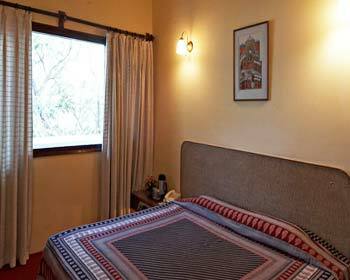 Also, the rooms are centrally air-conditioned. The earthy look and wall paintings of regal rooms keeps the guests connected with the earthy environment of the palace. Offering an amazing view to the guests, Imperial rooms present a beautiful view from window overlooking icy blue swimming pool and horse race track. The luxurious room has a spacious sitting area furnished with a sofa set and an in-room safe facility is a plus on security point of view for guests. 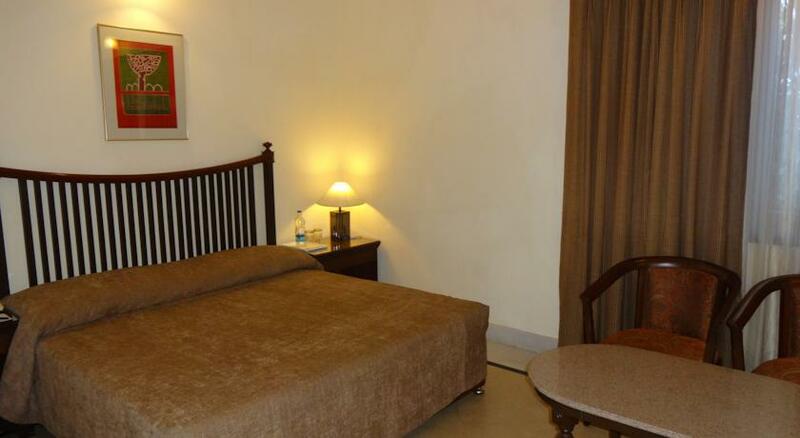 Like all other rooms standard amenities, the room has a LCD TV, mini-bar, coffee/tea making machine, cookie jar, air-conditioning system and complimentary Internet access facility. The bathrooms are equipped fabulously with a single vanity and deep soaking tub. Packed with such elegance and exclusive view, the stay in Imperial rooms makes cherish able memory in the hearts of its guests. Located in the old wing of the Palace, Suites have an elegantly designed living area featuring cozy sofas and 4-seater dining table. 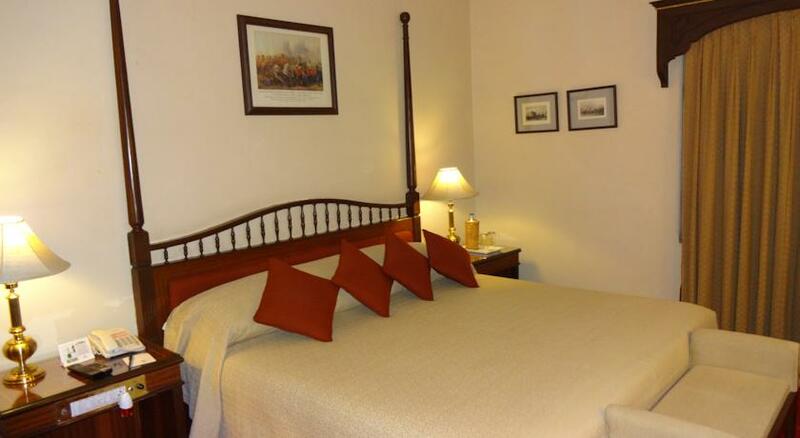 With a cuddly double bed arrangement, the bedrooms are facilitated with LCD TV, coffee/tea-making machine, private bar, in-room safe, telephone facility and 24 hours Internet access. Bathroom fittings and all essential amenities are kept up to the mark in all suites. And to keep the guests connected with their work on holidays, a tidy work area is furnished in the suite with a writing desk and upholstered chair. The only feedback the guests leave after a pleasant in the suite is simply wow! 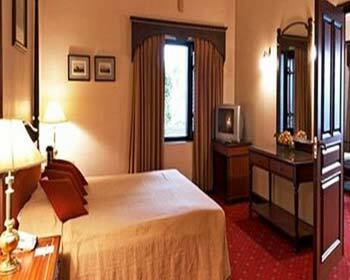 The Bourbon suite name is inspired from the French noble family, The Bourbons who got settled in Bhopal in 1783. 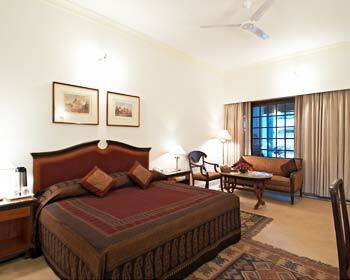 The beauty of the suite lies in the calm and serene arrangements with ample of space kept free for walking in the room. A sufficient workspace is provided with a writing desk and upholstered chair for its corporate travelers. The entire range of Bourbon suite is offered with LCD TV, private bar, coffee/tea-making machine, Internet access, telephone facility and all other standard amenities. The classy bathing atmosphere of the bathrooms is crafted with a single vanity, glass-enclosed shower, deep-soaking tub and WC. Named after the General Thomas Goddard who toured Bhopal with his hardy regime in 1778, The Goddard Suite has an earthy theme decoration with all modern amenities. 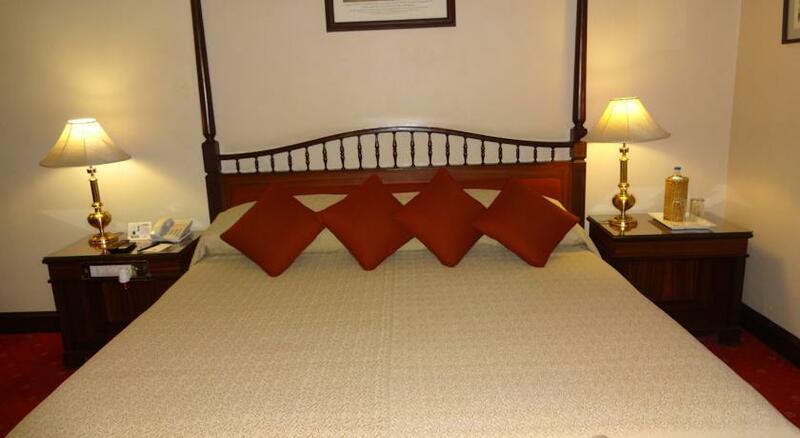 Moving out of the bedrooms, there is a wide living area featuring 4-seater dining table, LCD TV, in-room safe, mini-bar, coffee/tea-making machine, telephone, Internet access and all standard amenities. Also, the rooms are equipped with large wardrobe space for the guests requiring proper space to store their essentials in the suite. Like the Bourbon suite, a spacious work area is furnished in the suite with an upholstered chair and writing desk for the guests who never like to get away from their work. 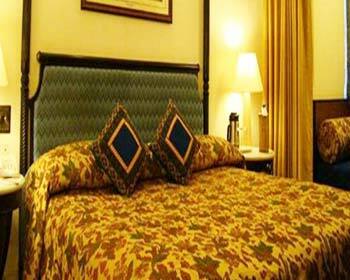 As the guest of Jehan Numa Palace in Bhopal, one can expect something beyond five star luxury. 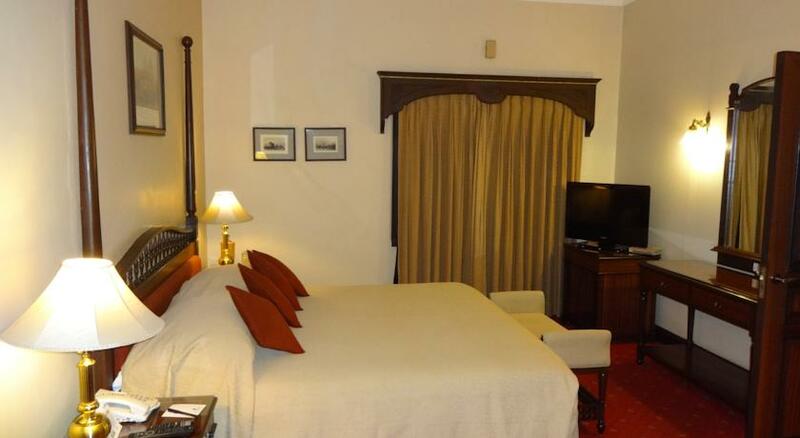 At this hotel the guests can opt from a number of accommodation options that include cottage, standard rooms, regal rooms, imperial rooms and Suites. Among the heritage suites is included the Bourbon and the Goddard. The guests are indulged to the maximum and the highly trained and courteous staff will pull out all stops to ensure that your stay is an unforgettable one. 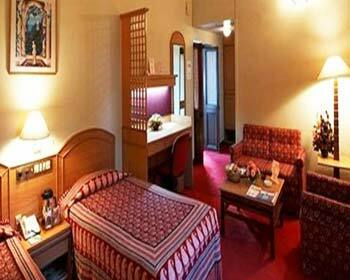 The rooms are a matchless amalgam of the elegance with the 21st century luxury. The optimum satisfaction of the guests is ensured by making available a host of updated in-room amenities. 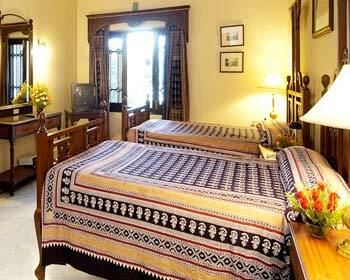 Named behind the poetic rhythm of Persian poet Firdausi, Shahnama is a royal beauty of Jehan Numa Palace. Floored with elegant inlaid artwork and lavish walls symbolizing scenes from Shahnama, the multi-cuisine restaurant serves a wide spread of oriental and continental delicacies. Demoed in both al-carte and buffet style, the chef of the restaurant steals the show with cuisines and its delicacies from all around the globe. The outstanding poetic ambience of Shahnama makes the dining experience of the guests more relishing and unforgettable moment. With a pinch of Italy style restaurant with rugged and calm white walls, La Kuchina is an open kitchen restaurant. Craving taste buds of Italian food lovers will surely be the happiest ones after having wholesome meal in this Italian and Mediterranean cuisine restaurant. The earthy color flooring with warmness in its shade and the soothing walls showcases an ambience similar to the old yet charming Italian eateries of Italy. Telling the story with its name, the signature restaurant, Under The Mango Tree of Jehan Numa Palace is situated under an archaic mango tree. 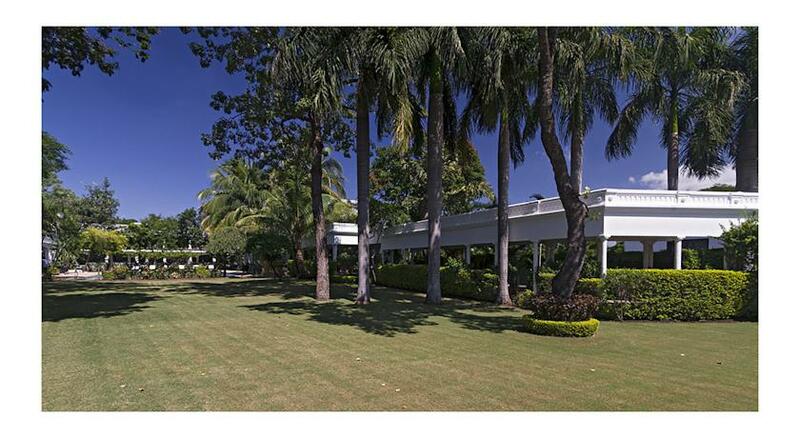 Build in an open veranda style overlooking green lawns, the ambience of the place becomes a royal castle dining arrangement. And to top this royal castle dining experience, the restaurant serves the best of Mughlai delicacies in royal style to the guests. While enjoying the meal, the scent of fresh lay out of flora in the green lawn swipes the mood of the guests to an another world of joy. The best hang out place for watching sports action with a variety of chilling beverage and toothsome finger food, Tattenham Corner is a lounge bar with a tribute theme to round the world horse racing era. Walls decorated with paintings of horse racing moments from round the globe and wooden oval bar gives a vintage look to the lounge bar. Guests can also catch the live action of their favorite sport on TV by making a simple request to the staff. 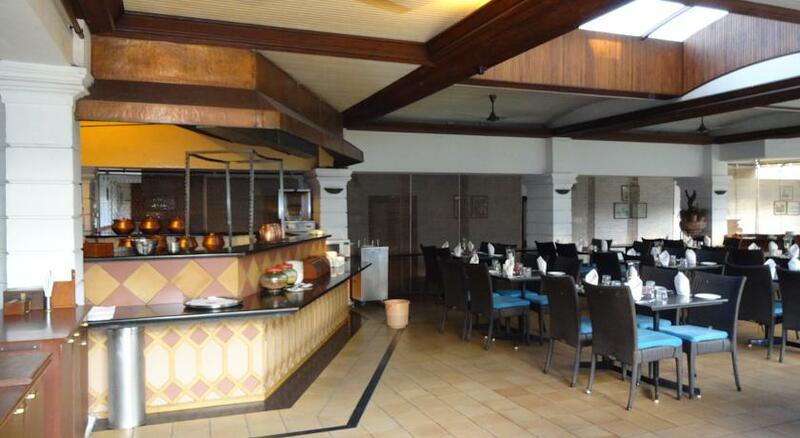 Shergar bar is another bar of the Jeha Numa Palace which is named after the popular race horse of Aga Khan. 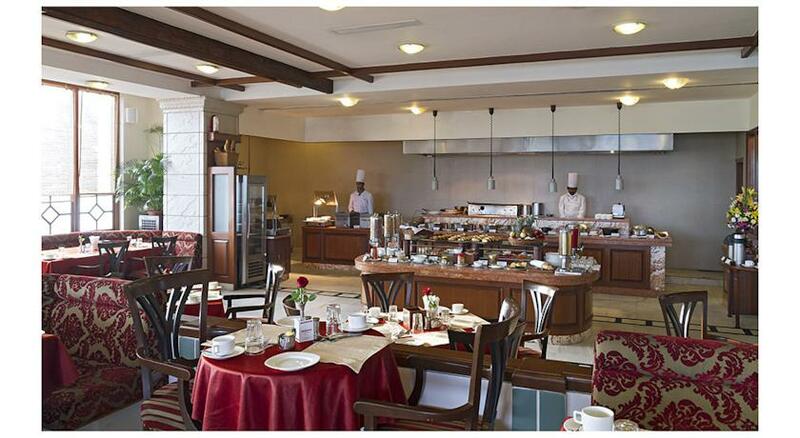 Crafted in a colonial setup style, the bar serves finger licking snacks with chilled drinks. The calm and composite ambience of the bar makes the bar just a right place for tired guests to enjoy their drink in pure silence. Guests can also tingle up their taste buds with delicious barbeques served along with their favorite drink. Located near the main entrance of the Palace to tempt the guests with sweet tooth, CafeChino is a sweet and yummy pastry shop and café. Serving the delightful sandwiches, shavarmas, rolls, pastries, breads, Belgium chocolates and teatime snacks, the café is a perfect place to jump in quickly for guests who arrived late and want to have quick bites. The team of CafeChino's chef is expert in driving its guest crazy with magical touch to the delightful desserts and delicacies.